Our Community Toolkit provides an Outreach Guide, logos and other identity materials, and marketing/promotions materials to make it easier for you to hold an event or facilitate dialogue with local leaders about the Liquid Assets documentary and water infrastructure issues. Please note: Tune in ads should be edited and placed ONLY by public television stations. A word about fonts: We are not licensed to distribute fonts. If you do not have the fonts used in the advertisements, please see the typography/color guide for more information on font alternatives. Please feel free to download one of our promotional graphics and post it to your organization's Web site. 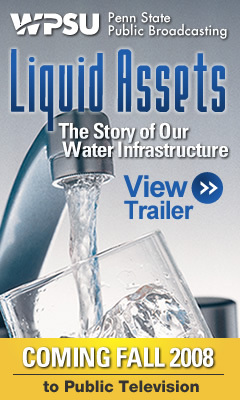 You can link the graphics directly to http://www.liquidassets.psu.edu to invite your site visitors to view the trailer.